"BoldGrid" Reviews (Apr 2019) - Why 4.9 Stars? 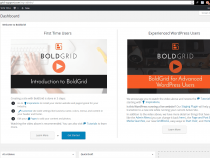 Among the first website builders to harness the awesomeness of WordPress, BoldGrid makes the world's most popular CMS accessible to all. BoldGrid is a drag-and-drop tool that helps beginners and experts get a beautiful site online in a snap. Boasting tons of templates and customizations, BoldGrid is a site-building game changer. “No matter how simple website builders are made, people still flock to content management systems — especially WordPress — by the millions. BoldGrid, an innovative platform created by InMotion Hosting, seeks to merge the two popular systems into one incredibly easy-to-use tool for producing vibrant, professional websites. Now forging its own path, the BoldGrid team is fine-tuning and growing a platform that introduces drag-and-drop simplicity to the limitless power and functionality of WordPress. Unlike other site builders, BoldGrid is free. Because it integrates with WordPress, you'll need a separate hosting account. Currently, you must be hosting your website on one of BoldGrid's approved partners (we recommend InMotion) to use the full platform. Fairly experienced WordPress users hosting elsewhere, however, can download a somewhat limited version and installation instructions. BoldGrid quickly shows newbies and experienced pros the path to website inspiration with a plugin that steers you to the right design, features, and content you may need. That's right — instead of nonsensical dummy content, BoldGrid gives you the images and text relevant to your industry, goal, or idea. “You can't get cheaper than free. That's right, the BoldGrid site builder and WordPress content management system are both available to everyone without charge. But there is a catch: to take advantage of such a stellar deal, you will need to create a hosting account starting at [host_price id='67' cat='wordpress'] a month. With extremely affordable plans available from several top providers, however, BoldGrid is sure to appeal to even those with the strictest budgets. BoldGrid is available to site owners whose hosting accounts give them access to either the Softaculous software installation portal or Plesk control panel, but we recommend turning to the hosting company responsible for birthing BoldGrid. Not only did InMotion Hosting empower its engineers to build such an innovative platform, but the company provides superb services for a great value. For roughly $5 per month, InMotion gives customers SSD storage, unlimited bandwidth, and email accounts, plus free backups, malware protection, and an industry-leading 90-day money-back guarantee. Site owners who want to move their files to InMotion will really enjoy the hassle-free, no-downtime transfers performed by InMotion's talented and friendly customer service teams. “We realize that pairing the technical might and prowess of a dedicated server with a simple drag-and-drop website builder is somewhat odd, but BoldGrid certainly meets the challenge. The free suite of WordPress plugins does more than hold beginners' hands and walk them through creating their first website. Enterprises and agencies will appreciate the speed at which BoldGrid enables in-house development teams to create, test, deploy, and stage vibrant websites. When looking for a dedicated hosting plan to match up with BoldGrid, look no further than InMotion Hosting, the company responsible for creating the builder. In addition to a 100% uptime guarantee, InMotion's single or dual processors come with included SSDs, managed updates, and hardware replacement in two hours or less. “With optimized servers and dedicated resources, VPS hosting environments are primed for high-speed WordPress performance. Whether you're managing multiple websites or looking to build and scale your first online presence, BoldGrid is engineered to make your VPS hosting foray both powerful and painless. Perfect for resellers and development agencies, BoldGrid promotes an efficient design and deployment process with hundreds of themes, integrations with stock photo libraries, and ready-to-go content. Site owners can test and tweak their work in BoldGrid's staging area before moving a site live. Like WordPress, BoldGrid requires you to purchase a separate web hosting plan. We love InMotion Hosting regardless, but their leadership, skills, and engineering ability in creating the BoldGrid platform certainly doesn't hurt. InMotion's VPS containers are housed in high-availability cloud server clusters, ensuring real-time redundancy and enabling live-state snapshots to further protect your data. The servers utilize performant solid-state drives that perform up to 20 times faster than standard hard drives, and the company supports PHP 7 and nearly every caching plugin. 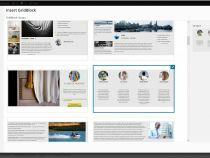 “Automating tedious tasks and reimagining the WordPress workflow, BoldGrid reinvents the wildly popular content management system as a user-friendly, visually appealing, and efficient publishing platform. The website builder takes care of the usability challenges WordPress often presents to first-time site owners, instead giving them all the tools needed to craft a stunning online presence. Experienced WordPress users will appreciate BoldGrid's familiar interface while appreciating and exploring the platform's added features. BoldGrid operates as a suite of plugins that guide users through the site-building process, starting with design and theme inspirations before moving through the page builder phase, customizations, and staging. The BoldGrid team also provides plugins for creating forms, building photo galleries, streamlining backups, and boosting your search engine optimization. Like WordPress, however, BoldGrid won't work without a hosting plan. We recommend InMotion Hosting, the company behind the creation of BoldGrid and a strong WordPress host in its own right. The company fine tunes its SSD-powered infrastructure for premium performance and security, tailoring services for WordPress users by managing security patches, supporting PHP 7, and providing caching plugins. “After taking the BoldGrid suite of plugins for a test drive, we experienced how the company makes WordPress more accessible for beginners and much more efficient for professional developers. Organized by categories for photographers, real estate agents, designers, and more, BoldGrid's Inspirations plugin comes with more than 200 responsive looks. Themes come with pre-installed plugins that add functionality, along with usable text and images — no more dummy content. Each theme is designed with multiple color schemes in mind, and BoldGrid will even recommend colors for a palette you started to create yourself. 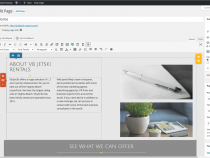 GridBlocks provide pre-built layouts to give you a head start on adding pages and content. You can use these to insert galleries, forms, text, and images without using shortcodes. Intuitive drag-and-drop functionality lets you accomplish clean column- and row-based layouts without having to code. API integration with Fotolia and Flickr gives you direct access to millions of stock photos. Search and select images from within the WordPress dashboard. In addition to generating SEO-friendly code, BoldGrid comes with a plugin to boost your search rankings. Set page titles and meta descriptions as you build your site. Preview changes on your staging site before publishing. The BoldGrid staging environment lets you try new plugins, themes, and updates to make sure there are no problems. Forms and photo galleries plugins add interactivity to your site. Easily create, manage, and customize how your forms and galleries appear and function. BoldGrid's mission is to make WordPress competitive with other top website builders. Developers contribute to WordPress Core code, tickets, and tracks. WordPress and BoldGrid pros help with support in community forums, videos, and how-tos. BoldGrid sponsors WordPress conferences and shares the same public license that allows users to run, share, and modify the software. Executive Advisory Committee of WordPress community experts will guide the BoldGrid president as he plans the site builder's future. WordPress can be a complicated system for first-time site owners, and BoldGrid does an admirable job helping users get the best design in a short amount of time. After putting BoldGrid's various features to the test, we really enjoyed the pairing of a user-friendly WYSIWYG site builder with the familiar WordPress interface. The BoldGrid software itself is free and pairs with the hosting plan of your choice. We strongly recommend InMotion Hosting, whose engineers originated the platform. The company's shared hosting plans aren't the cheapest you'll find, but the benefits are more than worthwhile: ultra-fast SSDs, reliable 24/7 support, and automated BoldGrid installations. Similar to WordPress, BoldGrid fosters a passionate community of users and developers to build support and awareness for the product. The company offers plenty of how-to guides and videos, but we wish BoldGrid could distinguish itself from other builders by having a complete support solution. The growing community will get there as more people discover BoldGrid, but it's still too young. That's why having hosting through an official BoldGrid partner, such as InMotion, makes the most sense. Wondering how BoldGrid stacks up againt other web hosting services? See our host-vs-host reviews below and compare them side by side. 2 out of 3 times. Among the newest of website builders, BoldGrid made waves by becoming one of the first solutions to effectively merge the popularity, flexibility, and power of WordPress with a more intuitive, efficient, and inspirational design process. Some will knock BoldGrid for not including ecommerce or analytics functionalities, but those are easily integrated with any number of free plugins found in the WordPress community. We're impressed with the robust, young platform already — excited to see how it continues to grow.